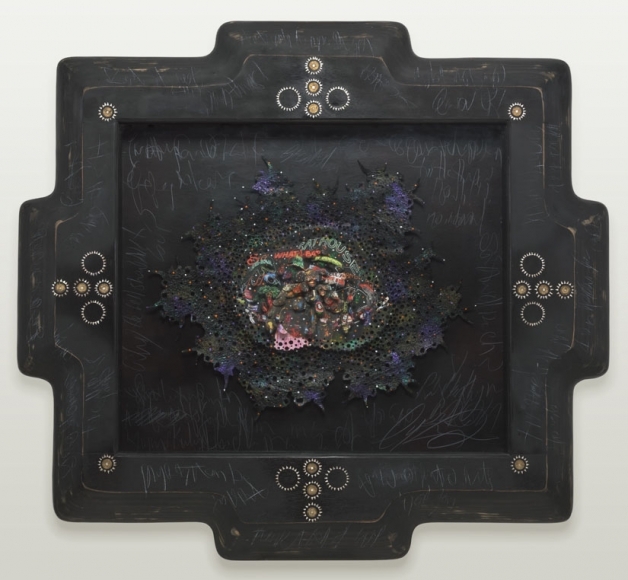 Ashley Bickerton (b. 1959, Barbados, West Indies; lives and works in Bali, Indonesia) was an original member a group of artists known as Neo-Geo, which emerged in New York during the 1980s. In 1993, he left New York for Bali, Indonesia, where his work took on a distinct tropical exoticism often in sharp contrast to his Neo-Geo work, which was an abstract and geometric exploration of consumerism and industrialization. However, Bickerton’s investigation of materiality remained a consistent thread throughout his practice. Often blurring the boundaries between media, genre, and subject (photography and sculpture; portraiture and landscape; realism and fantasy), he challenges the parameters of art making, calling into question the value and significance of the art object itself. While working in New York, Bickerton established a brand name for himself, Susie, which he has continued to incorporate into much of his work. In his early exploration of self-portraiture, Bickerton placed his invented Susie logo among the logos of other name brands that he used in his daily life: Marlboro, Fruit of the Loom, Renault. This representation of self as an accumulation of commercial brands was Bickerton’s method of investigating the complexity of consumer society and valuation. Around the same time, Bickerton produced several “still lives” that incorporated the Susie logo with a digital screen that displays the value of the work and tracks its fluctuating market value. After his relocation to Bali, Bickerton became more focused on hyper-realistic figurativism that parodied the Western fantasy of tropical island life. He began depicting himself, his family, and his friends in bright colors, dripping with overt sexuality and exoticism. For these works Bickerton designs intricate stage sets and paints directly onto his models, their clothes, and props, photographing them and then editing the images during post-production to create hyper-realistic yet artificial and disorienting scenes. Bickerton then works directly onto the photographic print using thick layers of oil and acrylic paint so that the components of photograph, painting, and sculpture become indistinguishable. The result is an eerie and often macabre scene of hypersexualized overconsumption. Bickerton received his BFA from the California Institute of the Arts in 1982 and continued his education in the independent studies program at the Whitney Museum of American Art, New York. Solo shows of his work have been organized at Newport Street Gallery, London (2017); The FLAG Art Foundation, New York (2017); and Palacete del Embarcadero, Autoridad Portuaria de Santander, Spain (1997). Select group exhibitions featuring his work include Brand New: Art and Commodity in the 1980s, Hirshhorn Museum and Sculpture Garden, Washington, DC (2016); Human Interest: Portraits from the Whitney’s Collection; Whitney Museum of American Art, New York (2016); L’Almanach 16, Le Consortium, Dijon, France (2016); Painting 2.0: Expression in the Information Age, Museum Brandhorst, Munich, Germany (2015); Ileana Sonnabend: Ambassador for the New, The Museum of Modern Art, New York (2013); Aquatopia, Tate St Ives, Cornwall, United Kingdom (2013); The Living Years: Art after 1989, Walker Art Center, Minneapolis, MN; This Will Have Been: Art, Love & Politics in the 1980s, Museum of Contemporary Art Chicago, traveled to Walker Art Center, Minneapolis, MN and Institute of Contemporary Art, Boston, MA (2012); Postmodernism: Style and Subversion 1970-1990, Victoria and Albert Museum, London (2011); Skin Fruit: Selections from the Dakis Joannou Collection, New Museum, New York (2010); Pop Life: Art in a Material World, Tate Modern, London (2009); Allegories of Modernism: Contemporary Drawing, The Museum of Modern Art, New York (1992); Word as Image: American Art 1960-1990, Milwaukee Art Museum, WI (1990), traveled to Contemporary Arts Museum, Houston (1991); and the Whitney Biennial, Whitney Museum of American Art, New York (1989). His work is in numerous international public and private collections, including The Museum of Modern Art, New York; Museum of Contemporary Art, Los Angeles; Stedelijk Museum, Amsterdam; Hara Museum of Contemporary Art, Tokyo; Vancouver Art Gallery; Museum of Contemporary Art Chicago; Walker Art Center, Minneapolis, MN; and the Tate Britain, London.